This page is now obsolete. Syncrify handles time zones automatically without changing any settings. When this option is checked, files on the server will use the same time zone that is being used on the client. 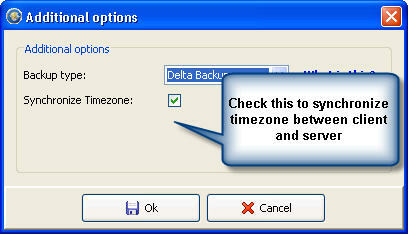 When this option is NOT checked, files on the server are stored using GMT time zone. To access this screen, click the More button under Advanced Tab. Click here for a screenshot. A backup is run with two-way sync enabled File is copied from server to client. Changes made by the user in California are lost. File is copied from client to server. They use two-way sync to synchronize files. Consider Initialize Seeding if you change this option, which will make sure the LMD on the server is correctly specified. Click Initialize Seeding under the Tools menu to start this process in Syncrify client. WHERE is this menu option? On the client or Server?